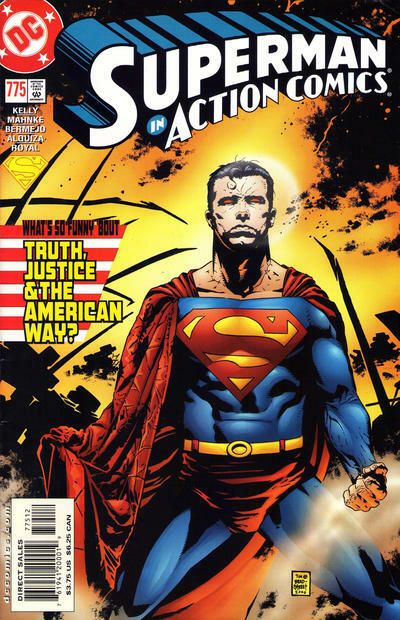 “What’s So Funny About Truth, Justice & the American Way?” is a story that appeared in Action Comics #775 as published by DC Comics in penciled1. Written by Joe Kelly, penciled by Doug Mahnke and Lee Bermejo, and inked by Tom Nguyen, Dexter Vines, Jim Royal, Jose Marzan, Wade Von Grawbadger and Wayne Faucher. Superman is 75 years old and has remained a beacon of virtue and truth in the comic world during that time. He has never purposed to kill because it was the only way to defeat a foe or villain or superhero in the DC Universe. He was the executioner in a story of John Byrne in Superman #22 in the pocket universe. He was left with no choice he felt as the only form of authority on a world where the General Zod of that universe had killed billions of people on that earth, he used the gold Kryptonite to disable them and green Kryptonite to execute them for their crimes against the now lifeless earth of that universe. Also, he was thought to have killed the unstoppable killing machine named Doomsday in the streets of Metropolis at the sacrifice of his own life which he would willingly give for the world he protected in Superman 75 in 1992. Superman values life and respects all forms of life both alien and earthly. So when a group of Superpowered beings began taking life when they thought it was the right thing to do, Superman objected to the careless taking of life to stop evil in the world. As the most powerful being on earth he could easily take a life but chooses to point men to resolve their differences without violence if possible. He could easily rule by his might and force people to bow to his will, but in his eyes that would make him as bad as the evil, he fights. His parents both the Kents on earth and Jor-EL and Lara on Krypton played a part in forming his moral outlook on life. This tale features The Elite, a team of super-powered antiheroes fronted by Manchester Black, who gained worldwide popularity for viciously killing their foes. Despite the acclaim and approval that the Elite are enjoying, Superman believes that they are in the wrong, continually defying the Elite even after they save a city. As tensions between them finally culminate in a mass showdown – taking place on Jupiter’s moons at Superman’s request – Superman, taking advantage of the fight being taped, makes it appears as though he has “killed” the Elite members – really using his speed to get them out of harm’s way at the last minute so that nobody sees it – to show the public that violence is never a positive thing, stating that he will never stop fighting his way to show the world what it could be. The Elite were vicious and self-seeking in their ideas how that society works and would do anything to control the situation that favored their idea of justice and what is right and wrong in the world. 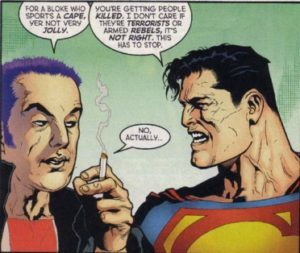 Under the leadership of Manchester Black, they were capable of taking over governments or killing officials if it suits their twisted morals. Well written and drawn this is already a classic story in the comic media. Superman had to come against this threat as only he can and this is why we have called Action Comics #775 one of the Greatest Comics of the 21st century. Joseph “Joe” Kelly is an American comic book writer, penciler, and editor who has written such titles as Deadpool, Uncanny X-Men, Action Comics, and JLA. As part of the comics creator group Man of Action, Kelly is one of the creators of the animated series Ben 10. Kelly received his MFA at New York University’s Tisch School of the Arts, where he still teaches Writing for Animation/Writing for Comics. At NYU, he was recruited into Marvel Comics’ editor James Felder’s Stan-Hattan Project, a program that trained potential comic book writers at the university. Kelly’s first published work for Marvel was 1996’s 2099: World of Tomorrow #1-8 and Marvel Fanfare vol.2 #2-3. During this run he authored What’s so funny about Truth, Justice & the American Way? in Action Comics #775, which introduced The Elite (an Authority-like team of anti-heroes) and their leader Manchester Black. That issue was called “the single best issue of a comic book written in the year 2001” by Wizard Magazine.